Now, three years later, an appeals court has eroded her courtroom victory even further by ruling that the leadership of the Jehovah’s Witnesses had no duty to warn congregants that a confessed child molester was one of their own. As a result, judges eliminated the punitive damages in the case. Conti still stands to receive $2.8 million. Some are calling it a victory, but I think that’s debatable. The court did acknowledge that the Society did what it was accused of doing; withholding information from the congregation. But you have to dig through the stories to find that one out. Most people will just see that she lost and move on. Here’s a little more from the article. Conti has 30 days to appeal the decision. This was better than some videos. The elders really do seem to be engaging with him in a conversation. I’m looking forward to part 2. That link will surely work for atheist readers, too. Did Jehovah’s Witness shunning drive young Brit towards Islamic extremist radicalization? UK newspapers are reporting that a young British man, who has been found guilty of plotting to behead a soldier, was radicalized into Islamic extremism after being kicked out of his home by his Jehovah’s Witness parents. The clip, meant to stress the importance of paying attention in church and meetings, has been criticized for insinuating that not fully focusing during such gatherings can result in dying, even connecting the concept to the story of Noah’s Ark. JW.org has not yet responded to the backlash. Jehovah’s Witnesses have their share of problems with making converts too. They just don’t talk about it. So the Society’s “truth” is all about the Bible and scripture, huh? 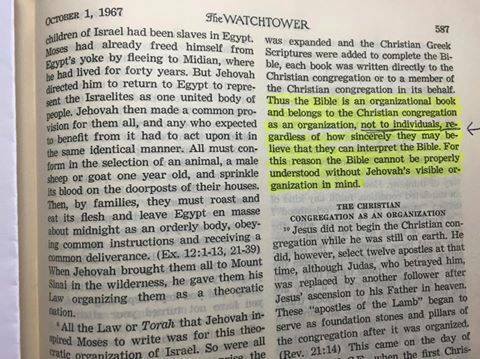 Finally, I added this one as a reminder to Jehovah’s Witnesses who keep asserting that they follow the Society because its teachings are Bible based. The reality is that even the Society says you can’t arrive at their “truth” by following scripture. Most denominations of Christianity use the Bible just as the Society does: by interpreting it to suit their own beliefs. Not simply following the scriptures “as is.” Having a Bible quote to back up every doctrine is not the key to finding the true religion, if such a thing exists. To put things into context, look up “true religion” and add the name of any major religion in a Google search and you’ll find papers arguing that the religion you added is the one, true religion. And all of them will quote scripture. I once found one that argues Catholicism is the true religion while refuting the Society’s claims to be the same. All of them leave a bunch of scriptures out while focusing on the stuff they do well. Using scriptures to back up your doctrines really isn’t a big deal and doesn’t prove much.